According to the original Ghostbusters script, "DANA BARRETT [is] an attractive woman in her late twenties... Guys on the street check her out as she enters, but she coolly ignores them." Dana is basically the role of the damsel in distress and subsequently becomes Peter Venkman's love interest for the duration of the two films. 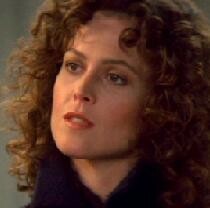 Played by Sigourney Weaver, Dana Barrett is a character which adds a bit of real class to the ensemble cast. In the first movie, she contacts the Ghostbusters after noticing strange things happening in her apartment. She is eventually possessed by Zuul the Gatekeeper, and united with Louis Tully, who was possessed by Vinz Clortho the Keymaster, summoned Gozer to reappear. After summoning Gozer she along with Louis transformed into the Terror Dogs. After the Ghostbusters defeated Gozer, Dana was freed from Zuul's control, and returned to human form. In Ghostbusters II, Dana is once again a key part of the plot, as her son Oscar is kidnapped for Vigo the Carpathian so that he may possess the child and return to human form. In the end the Ghostbusters defeated Vigo and saved Oscar, returning him to Dana.